Managing tags for your conversations is an essential ingredient of a well-prepared and well-organized support team. Tags are helpful for bringing attention to specific conversations. They're also great for grouping conversations together and can be used in situations where you need to file certain conversations as high priority. You can think of a tag as a label. If you're familiar with Gmail, this will make a ton of sense. You can open a conversation, select a tag just like you would a label and easily refer back to it at a later time. Tagging therefore acts as a filter and allows you to access conversations with a click of a button. Tags can co-exist with other tags just like labels. A tag can also act as its own folder. We often get questions about "folder-ing" in Re:amaze. This is a concept passed down by archaic email clients and unfortunately still plagues all of us. A folder is essentially a tag. You group conversations that share certain characteristics together and easily find them. If you need a folder, make a tag! At any point, you can assign a conversation any of these tags and they'll be instantly moved into that "folder". Once something is escalated, simply remove the tag is had before, maybe "High Priority", and add the "Escalated to Engineering" tag. Since tags can co-exist with other tags and you find it beneficial to leave the previous tag untouched, that is entirely your prerogative! The Tags Manager (found in your Re:amaze settings menu) will allow you to pre-create the tags for easy management and so your staff have an idea of what they have to select from. You may want to avoid having staff agents create tags on a one-off basis as this can get quite messy. 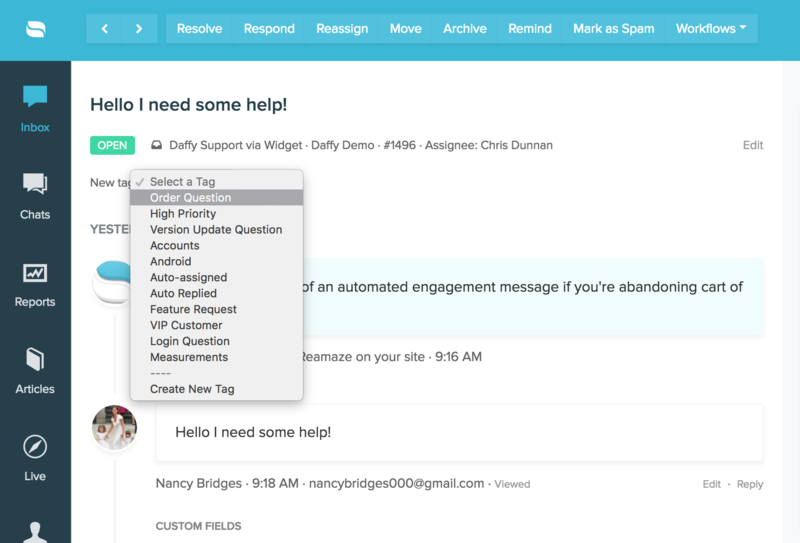 The Tags Manager is intended to help you better "manage" these situations. You can also use the Tags Manager to sort and re-order tags. Previously, tags were listed on the main dashboard in alphabetical-numerical order. You can now freely drag and drop their ordering. This is beneficial when the "VIP Customer" tag, which is used a lot, is not at the bottom of the list. While responding to conversations, you can select a pre-created tag from the drop down menu. Need to find a tag quickly in a long list of tags? Simply open the drop down menu and start typing the first few characters. Most browsers nowadays will instantly search for you. Tags will also show on the dashboard view to give you a better idea of what a particular conversation is about! Tags work well with Re:amaze's workflow automation as well. 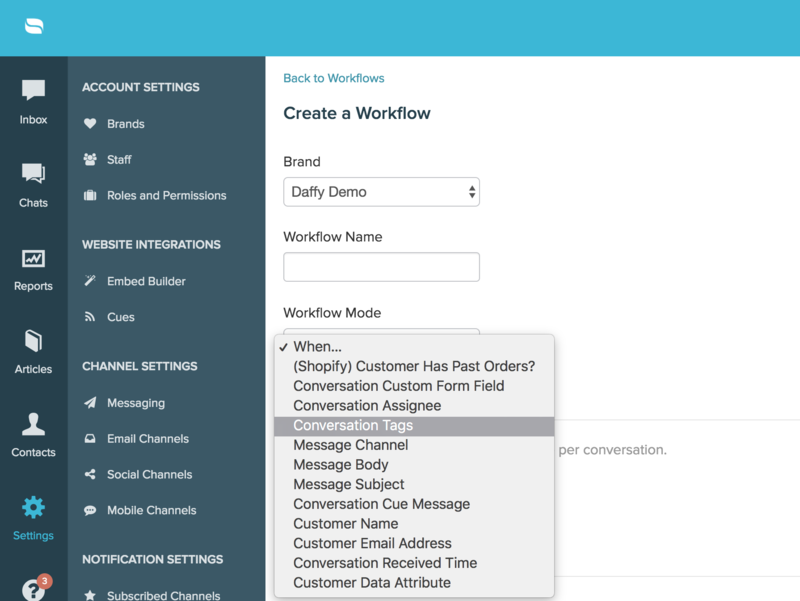 You can use workflow automation to automatically apply a tag to conversations that have matched certain conditions. More on workflows here. 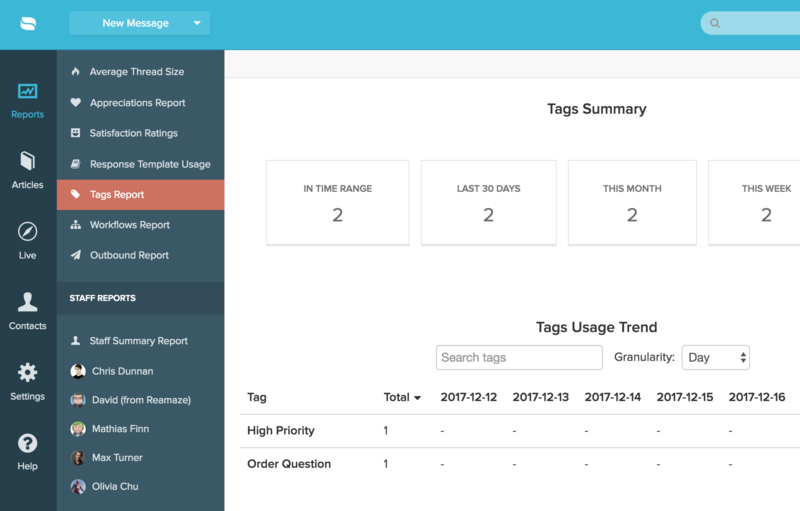 Tags work in reporting to help you narrow down specific performance metrics. Tagging is a big part of reporting in Reamaze. 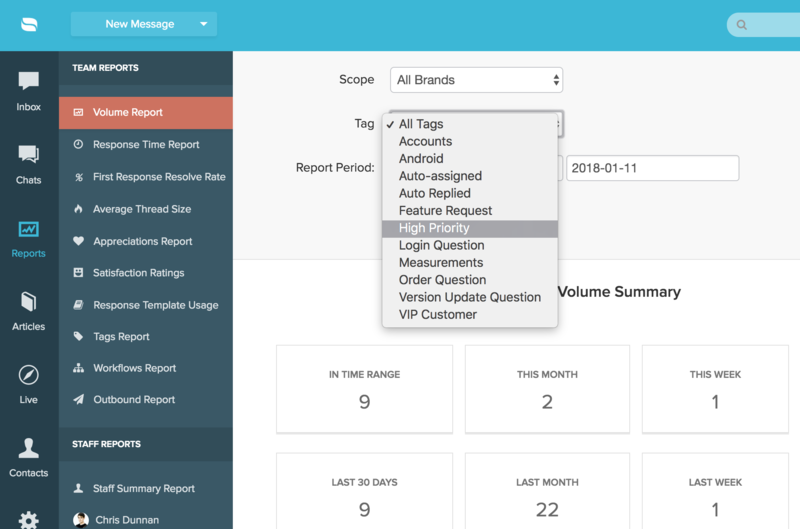 For almost every report, you can drill down on certain tags to make your scope narrower and get much more accurate metrics. You can even view a tags report to see which tags are used often. A tag with high adoption usually indicates a pattern of some sort.